Thousands of bloggers, perhaps tens of thousands, are raving mad because a major source of affiliate revenue has just been removed from them. In an email to its ‘Power Pinners' late last week, Pinterest stated all affiliate links, as well as all redirects and trackers, would be removed from the site. Particularly hard hit are affiliates with links from two popular affiliate networks, RewardStyle and Hello Society, which are being specifically targeted. According to Pinterest, no pins will be deleted. The past Pins will still show up and be clickable, but the tracking links will be stripped. So, those who were using tracking links from bitly.com just for tracking will have their links stripped. Why am I NOT surprised Pinterest banned affiliate links? Ask yourself WHY as a Super affiliate marketer of 17+ years (15 years full-time) experience – did I NOT devote time working Pinterest, or add a section to my coaching programs about ‘how to monetize Pinterest‘? Because the writing was always on the wall. I've only come across one blogger who was smart enough to mention the ‘additional step' affiliate bloggers need to do now in light of this turn of events at Pinterest — that they'll have to link back to their own sites — and they actually lamented that fact. Ah, pity, they (affiliate bloggers) are SO HARD done by… yet that's what they should have been doing to make a secure full-time income as affiliate marketers … basic online business stuff that I've been teaching since 2003. For those of you who remember what happened to affiliate marketers who played the “Google Cash” game – direct linking to merchants from Google Adwords (and Google was PAID for those links) – Pinterest was bound to follow suit sooner or later. Pinterest has disallowed Amazon affiliate links for years, yet some affiliate blogger / marketers put their heart, soul and all of their effort into monetizing Pinterest through direct linking to their merchants, despite the obvious sign of impending doom. Do I feel for them? The message is and always will be – work to build a business (emphasis on WORK). i just started using Pinterest to promote my niche site and Etsy selling platforms. 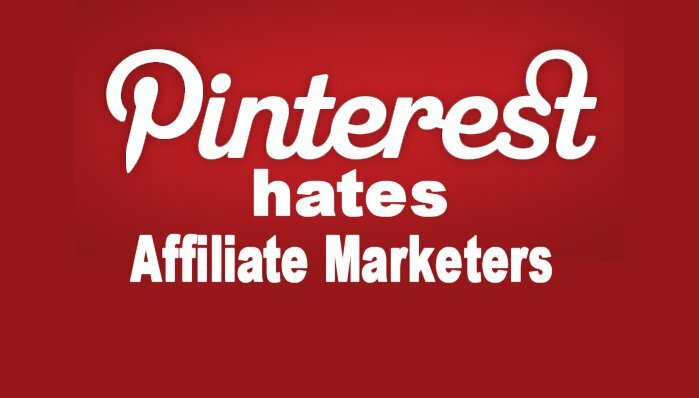 I had heard that there was a problem using Pinterest and Amazon, that they both stripped out the affiliate links in Pinterest boards. As a workaround, you suggest original blog posts on your own sites. These I have. The question I have is should the product description in Pinterest match my blog post copy? I use a lot of product category tables that I found easy to add copy to, since several of the products in my hot sauce niche usually have very little. With the tables, I used 50-100 words of copy along with an image and a link. That worked pretty well. I was thinking of a using the description copy in the pin with a link back to my blog post and changing my table into providing only the product image and link to wherever it’s selling. if I kept both descriptions the same, would I incur a Google penalty for duplicate content? P.S. My current fave is Tapatio. Against my better judgement, I actually tried affiliate marketing using Pinterest and it didn’t even work. I think I felt too guilty and it affected the mojo. It always seems like a bad idea to link from a social site directly to an affiliate page. I have used Pinterest for fun (and profit/traffic) and link graphics directly back to my website. Excellent points have been made: don’t be dependent on third-party websites, send traffic to your own website, build your list, develop relationships, and presell the affiliate product. I have had the experience (more than once) where a major company has decided to discontinue its affiliate program (without telling anyone). If you had direct linked to their program, your traffic would be wasted. On the other hand, If you had linked to your own site, you could recommend an alternative product. You are SO right. Over the past 17 years, I’ve had the experience of discovering that an affiliate program was closed, by accident, or more often through Broken Link Checker. What’s worse is when they redirect the affiliate links and the plugin didn’t pick up the problem. Am I on Pinterest? Yes. But like you say, link back to your own blog or site. This just makes more sense to me anyway. It seems obvious that one would want the traffic to their own site for a couple reasons. One, they just may get someone to sign up to their list. Thus another opportunity to sell to them again. Two, the visitor just may come back to your site for more and bring their friends. Excellent advice as always, and very timely as I’m a late-comer to Pinterest and just getting started. I noticed you linked to one of your previous posts about BANS. I know BANS has been around for several years now and wondered if it is still relevant? Thanks for sharing and caring – I’m glad to be back too! I would consider BANS still relevant provided you accompany their builder with your own commentary and recommendations. Good to be here. I think it’s the first time I here.and certainly this is no good news for those marketers who invested into drawing traffic from Pinterest. Though I wasn’t an active user, I can definitely tick right what you said here. Linking directly to merchant’s site is old schooled and now, we are understanding that redirecting links is taking us to a huge wall. The best as you said is to link back to your personal blog where you can presell a product and increase your chances to generate sales. Thanks kindly for stopping by and sharing your thoughts with us. We look forward to hearing more from you! I had a hard time getting to know, understand and Like Pinterest. And so I decided to devote my time through other Social Medias like Facebook and Twitter, and erased my account with Pinterest. Perfect timing. Pinterest has also banned CJ redirect links for quite some time. Content is still KING. Because of that I’ve always treated Pinterest the same way as I treat banners ads. It’s just one way to get people to my site. Once I get them to my site then it’s up to me to help them decide if the item is really the best for them. I just started to get into Pinterest so this article stands out to me. Thanks for opening my eyes. My pleasure and you’re welcome! I knew there was a good reason I did not put much effort into Pinterest. It looks like everything is going back to the affiliates and their own sites to provide the value to readers and then monetize their own sites. Directing folks to your own site first has always been the best way to do business as an affiliate. I don’t see that changing at any point. miss this update and good sound advice. I’m glad you remembered what I said… too bad she didn’t take your advice. Those who fall for the hack-of-the-month trickery will always suffer. WHy do they never learn? What’s the big deal about posting a useful article about the product to your blog first, then pinning/linking to that? Good solid principles – build your business and relationships first, and you won’t go wrong. Someone said that Pinterest uses its system that scans its network for affiliate links, and then change those links to its affiliate ID. So Pinterest makes more profit. So create a landing page contain the aff link or using trustable and paid cloaking service. Don’t directly put an aff link into a pin.